The GE U33B diesel-electric locomotive model was offered by GE in 1966, featuring a 16 16 cylinder motor. It is 60 ft 2 in (18.34 m) long. 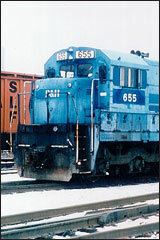 The GE U33C is a 6-axle diesel-electric locomotive built by GE Transportation Systems between January 1968 and January 1975. 375 examples of this locomotive were built for 11 North American railroads and one construction contractor. project: u33.spj FM SDF: u33.sdf Author AJ Ireland Digitrax Inc. Sounds recorded by C. Brown, AJ Ireland.